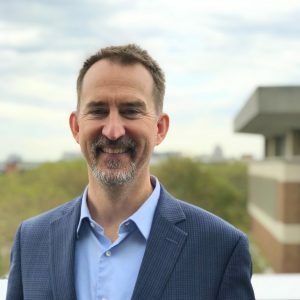 Brian Steensland is Professor of Sociology and Director of Social Science Research at the Center for the Study of Religion and American Culture at IUPUI. He is also Director of the IU Consortium for the Study of Religion, Ethics, and Society. Professor Steensland’s research interests include religion, culture, civic engagement, and politics in contemporary American society. His books include The New Evangelical Social Engagement (Oxford, 2014), co-edited with Philip Goff, and The Failed Welfare Revolution (Princeton, 2008), which won both the Mary Douglas Prize and the award for Distinguished Contribution to Scholarship in Political Sociology. He has published on topics such as religious classification, American evangelicals and contemporary politics, mainline Protestantism and welfare reform, and Christianity and free-market economics. His co-authored article “The Measure of American Religion” (Social Forces, 2000) won the Best Article Award in the Sociology of Religion. His article “Cultural Categories and the American Welfare State” (American Journal of Sociology, 2006) won the Best Article Award in the Sociology of Culture. Steensland’s current research focuses on spirituality and spiritual practices, and religion and urban life. He has a textbook on religion and society under contract with Wiley-Blackwell, serves on the Editorial Board of the Journal for the Social Scientific Study of Religion, and is an elected Council member for the Society for the Scientific Study of Religion. In 2016-17 he served as Chair of the Sociology of Religion section for the American Sociological Association. Steensland teaches undergraduate courses on sociology of religion, social problems, social theory, and introduction to sociology, and graduate seminars on sociological theory, sociology of religion, cultural analysis, political sociology, and textual analysis. He twice won Indiana University’s Trustee’s Teaching Award and also received the Edwin H. Sutherland Excellence in Teaching Award. From 2002 to 2014 Steensland was a faculty member in the sociology department at Indiana University-Bloomington. He earned a PhD in sociology at Princeton University in 2002.